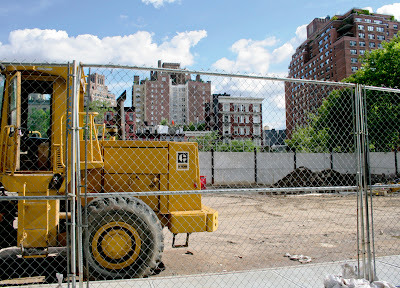 At Greenwich Street, Little West 12th Street joins in, and, along with Gansevoort, forms a plaza. 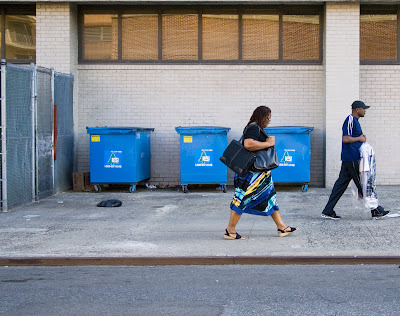 The shock of this encounter prematurely transforms Greenwich Street into Ninth Avenue. This shot is taken looking back from where we came. See the Charles Nolan store off in the background? This gal in the foreground is carrying a bag from Zadig & Voltaire, a store on Washington Street, around the corner. The New York Times's Critical Shopper wrote an amusing article about checking out the merchandise. But skip the first half, which is not amusing, just confusing. Apparently, until last year, this area was not a plaza, just a really wide and unregulated meeting of three streets, very difficult for pedestrians to navigate. I don't know if this is considered complete. I hope not. Anyway, it's safe. Read about it here. 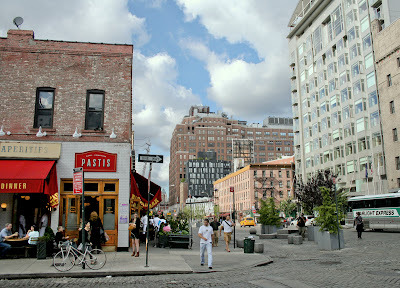 The northern edge of the Plaza is defined by the famed restaurant Pastis on Little West 12th, famed more for its scene than its food although the food is judged reasonably good. Oh, okay, why Little West 12th? 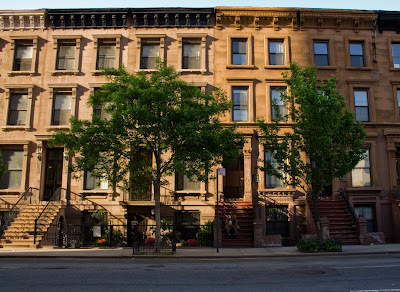 Because it's only one block long, from Ninth to Tenth Avenues. It's separated from 12th Street proper by a mess of streets typical of Greenwich Village, so I suppose it's always been that way. P.S. If you link to the map below, and go to the street view, you can get a good sense of what it must have been like to try to cross that street. Now we're in the Meatpacking District for sure since we crossed Hudson Street. Notice the bricked street which just began. This is the Charles Nolan store, looking quite spiffy in the afternoon sun with its little jaunty hat. In other news, I just want to say that although it is gratifying when people take the trouble to comment on a posting, I just have to wonder about my readership when the item they've commented on the most in recent history is a pink alcoholic drink. For those who missed it, you'll find it in the June 20 posting. 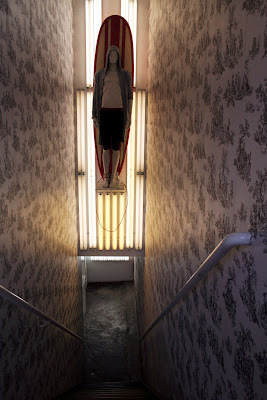 This is the entrance to Buckler, a store carrying a "cult menswear line" according to Time Out. I was quite taken with the look of this – it made me think of some initiation hut on a South Seas Island where young boys go to be terrified into becoming men. And this is the totemic presiding spirit. Then I looked up Buckler online and the first thing I saw was this figure dressed in a suit. No board. What a letdown. Just an ordinary store. I'm undecided about the eastern boundary of the meatpacking district. It depends on if you are literal (like me) and think of it as the area where there used to be lots of and still are a few meatpacking plants. Or if you think of it as the trendy place it is with cult menswear stores and prizewinning architecture and fabulous restaurants. 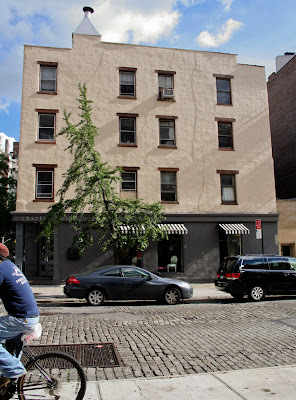 Historically, Hudson street was the boundary, but obviously this block is part of the scene. 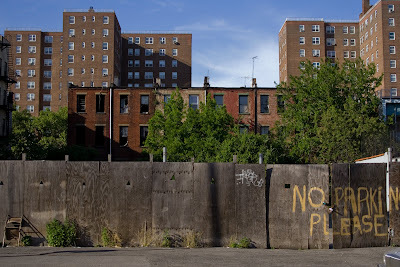 One article I read referred to this area as MePa which makes me want to throw up. I hope people aren't really saying that. If they must shorten it, couldn't they just say MP? 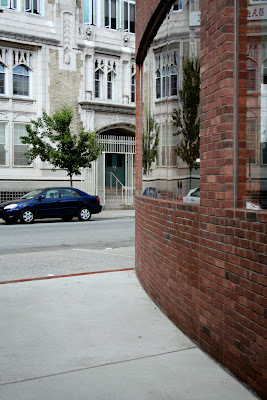 This is what's across the street (the other side) from Yamamoto. Trembling with potential. Gansevoort Street was named for Peter Gansevoort, a 4th generation Dutchman from Albany, who was made a colonel in the Revolutionary War. As far as I can see, he never lived in New York City. So why? Before that the street was called Great Kiln Street because a lime kiln was located there. Knowing this, I had to find out what a lime kiln was, and it turns out to be a kiln that produces quicklime which is used in many things, including plaster. If that was all I learned, I wouldn't be bothering you with this, but no. You know the word limelight? Guess what? When you heat quicklime really really hot (4,300° F), it creates an intense glow and they used in the theater before the invention of electricity. They called it limelight. Hint: if you click on the map link below, you can see what the building looked like before it was transformed into Yamamoto. Remember Y-3 from 2 nights ago? If you went to the article as you should have, you'd know that Y-3 is a collaboration between Yohji Yamamoto and Adidas; the Y is for Yamamoto and the 3 is for the 3 stripes of the Adidas logo. This is the new Yamamoto store. Well, an edge of it. 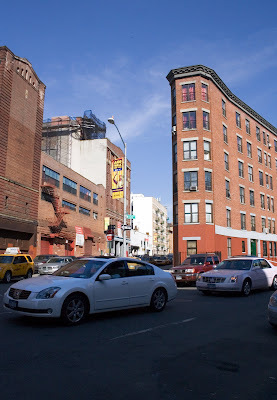 It's fitted onto the triangle that the streets make when Gansevoort meets 13th at an angle. It's way cool. 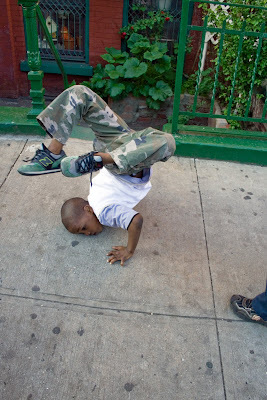 Go here to see some wonderful photographs by Iwan Baan. He shows the building from all angles including above, and you can see the entire building and how it fits on the street. I hadn't heard of him until tonight, but apparently he's well known and "increasingly influential" in the architecture photography world. I wonder if he gives lessons. Next go here for a short piece on why this store won a prize for the architects. You'll discover what that red line in the sidewalk is. Note that this is across the street from the Notre Dame School. 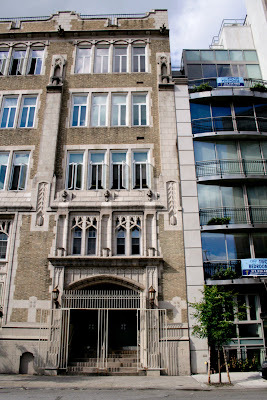 The building on the left is the Notre Dame School, a Catholic high school for girls, although they only recently located here. 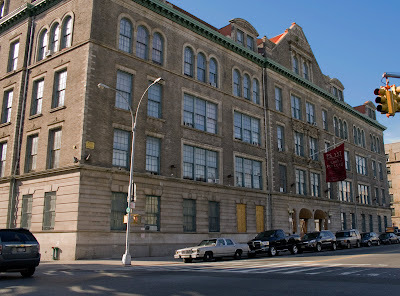 This was originally a New York City School (I think), built in 1916 in the uplifting style of the time. 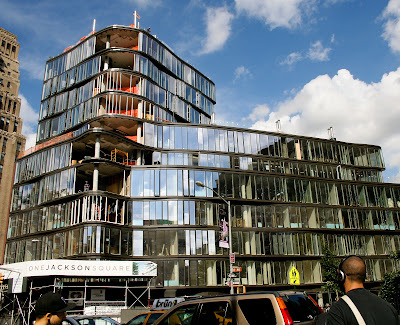 I had another, wider shot of the school, but I wanted to show you this sliver with the building next to it, The Gansevoort, to see if you agree with me that this new architecture is very compatible with the old. 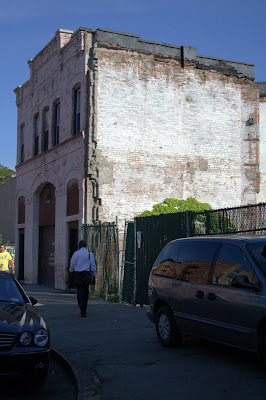 If you follow the link, you'll see a rendering of the building nestled between the two older ones. You can also learn that the penthouse is still available for $5,250,000. 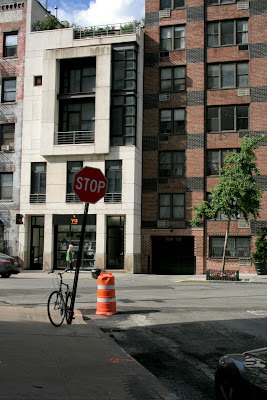 West Fourth Street's erratic run is finally stopped here at 13th Street (see the stop sign? ), and it's a good thing, too. Otherwise, we'd have it going up the Upper West Side and we already have Broadway. Across the street is Y-3, which I now find out I definitely should have visited. I was going to copy a paragraph from a New York Times article to explain, but they must have an anti-plagarism device embedded in their text because I made two attempts and both times my document froze solid. So you must go there. It's worth the effort. Sometimes I just want to throw up a photo of street signs. 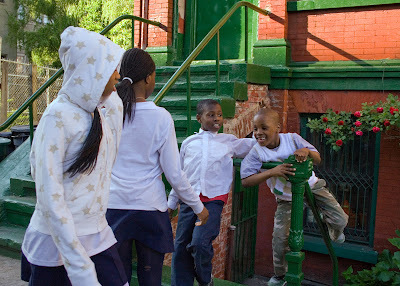 So Friday late afternoon, FL and I head downtown to meet Myra to go for a walk on the just opened newly done High Line. High excitement. And FL consented to go early so I could get a photowalk in. And not only did it not rain, the sun came out. Things to be thankful for. Tonight I'm going to show you two buildings, the old and the new. Well, part of the old. 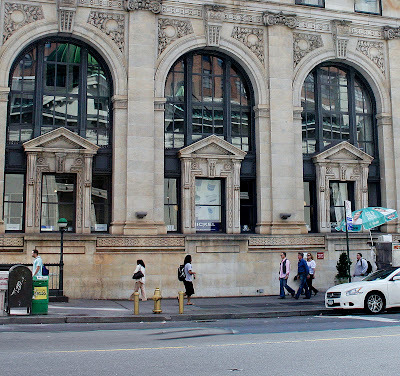 This was originally the New York County National Bank, built in 1907. If you crave to see the whole building, click on the above link. Can you guess what it is today? Why, a men's spa, of course. Nickel, by name. They have designed it to look like the inside of a submarine which results in a "masculine yet sophisticated environment." Funnily enough, the Chinese massage place that FL, Myra and I dropped into after dinner for $10 worth of massage each also looked like the interior of a submarine. There's where the resemblance ended. Sophisticated, it wasn't. 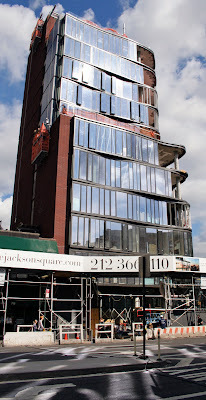 Now, around the corner on Eighth Avenue, we have One Jackson Square, almost finished. What recession? FL was taken with the building, especially the shiny parts, but objected to the brick. She thought it should be some kind of gray metal. Surprise! It has a long side, too. 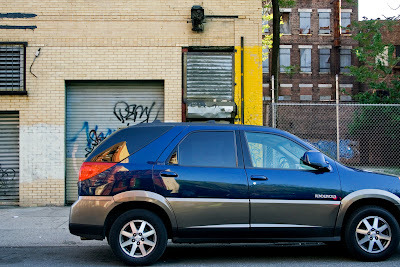 Along Greenwich Avenue. It does look better on this side where no brick is showing, don't you think? I need to wrap this up tonight; I've been on it over 4 weeks, for god's sake. No wait a minute, one week of that was inactive due to vacation. Well, even three weeks is too long. 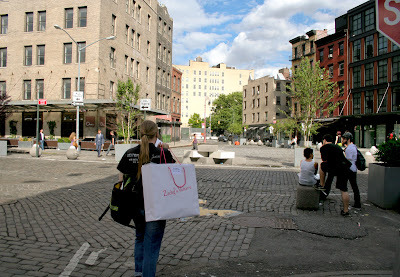 Anyway, yesterday, I went on a new walk, in a new area for this blog: the meatpacking district! To visit the brand new High Line. But in the excitement of the new, I cannot neglect the old. 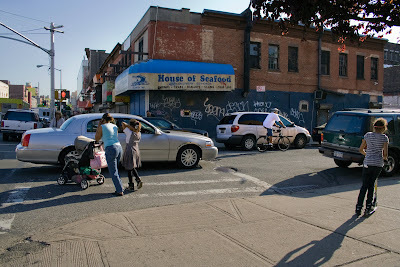 Below are two from the last block on 126th Street, and then I'll show you where I finally found dinner. You may remember I was looking for a place to have dinner and not having any luck. But here, what's this up ahead? 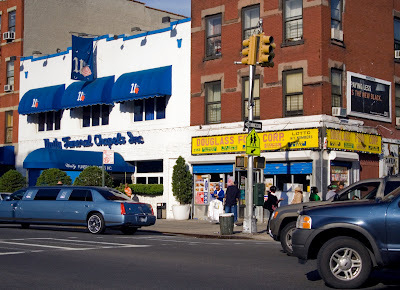 Lenox Avenue and restaurants, primary among them, Sylvia's, the old-time famous Harlem soul food place. I haven't been there since the 80s when I went with a black man and we were treated a tad frostily. Twenty-four years later, maybe it's time to give it another chance. I enter. I see many large groups of white folks. 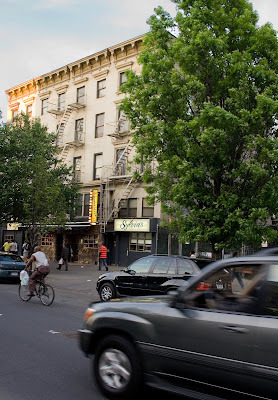 In fact it looks like Sylvia's is the Harlem restaurant for white people. Not that there weren't any black people, but they were definitely outnumbered. I was very graciously shown to a table, alone in my singleness. It is time for a drink, I think, looking over the cocktail list. Cocktails seemed safer than wine. 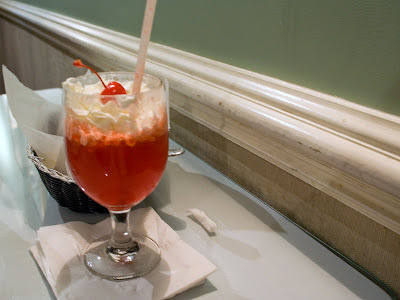 I order a strawberry daiquiri, it seems like a good match for soul food. Omigod, here it comes; it's topped with whipped cream and a cherry! I am mortified. Luckily, no one is paying any attention to me. I order a fried pork chop, candied yams and pickled beets. Whyyyy didn't I order collard greens, blackeyed peas, mashed potatoes, anything, but candied yams? The candied yams were triple sweet with some sort of non-yam taste to them. Pickled beets are pretty much pickled beets. The pork chop, however, makes everything worthwhile. I almost never eat pork anymore since it's gotten so lean and dry and tasteless, but I had a feeling Sylvia might know where to get some unevolved pork. She did. It was great. I would go back there just for that pork chop. The building across the street is the Adam Clayton Powell Jr. State Office Building which we've seen before from the front. I can never resist a shot with color coordinated clothes. I mean, of course, coordinated with their surroundings. Would you have guessed that bright blue and white building was a funeral home? Their website asserts that, contrary to rumors, Unity Funeral Chapels Inc. is NOT owned by a white funeral home chain. Rather, it is owned by five African-American entrepreneurs. Check it out. The problem, you may have noticed, is that House of Seafood is closed. Here's an article from the New York Post in October 2007 that tells why. Redevelopment. I do like a good fish sandwich, and the best one I ever had was a whitefish sandwich in upper Michigan. But even that wasn't thrilling. And now it looks like I'll never have a thrilling fish sandwich. But what I mean about what gets me about this project is that it seems everywhere I look there's more there than I think. It's so rich. There's so much. This is why I go ever slower and slower. 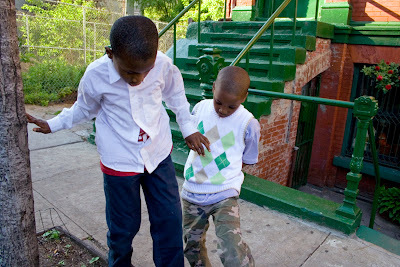 As I was shooting the house with the bower of roses (see two posts back), these two boys came ambling down the street. An instant later, they looked up and saw me. Did you take my picture? one of them asked. Yes, I said. Take a picture of this! they cried as they began performing. Take a picture of this! Take a picture of this! Take a picture of this! I wonder when they're middle-aged, will they shake their heads and say uhn, uhn. Just as I was about to wrap it up and ask them their names, these girls came along. What, are you modeling? one of them asked. I didn't hear the rest. Next thing I know, they've taken off back the way they came and the girls are walking off in the opposite direction. Sorry to be a day late, but I was spending the night at the airport in Baltimore (don't ask). U. S. Air did it to me. Yes, I'm naming names! That'll teach em to mess with a blogger. They cancelled the 5:00 and 7:00 p.m. flights to New York because of weather and wouldn't reschedule. 6:00 a.m. was the next flight. And told me blandly, since it was weather, we can't do anything for you. It was hard to be zenlike. Well, impossible. But of course, if you get tired enough, you lose your punch. On to happier things. Like, great vacation!, great to be home! Now, I have to go to bed. I'll be back next Thursday. Don't forget! Meantime here's a pretty summertime photo. Note: we've passed into Central Harlem. 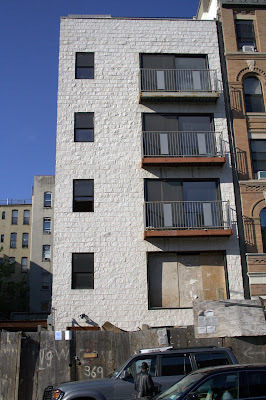 This is the last block in Manhattanville and it's a short one, so I'll take care of it in one posting. I couldn't seem to resist white buildings against blue skies today. Here's another. Just down the block is this imposing building with no clue as to what it is. I played a guessing game until I got to the corner and saw the front of it. 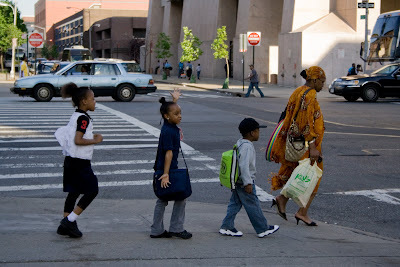 PS 157! An elementary school, at that. That is, it was. 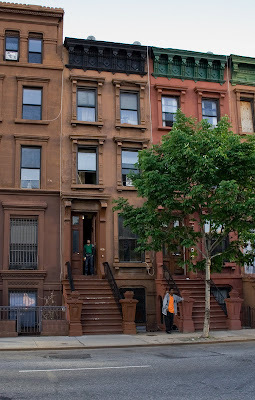 It closed in 1975 and then gradually deteriorated until it was rebuilt as apartments in 1989. 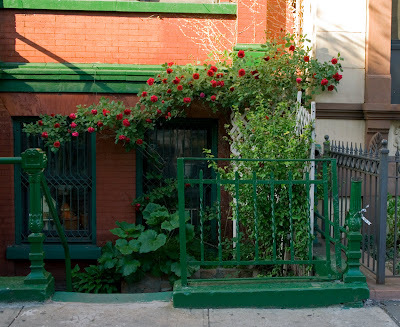 Don't you just wish you could live in something other than a boring old apartment building? 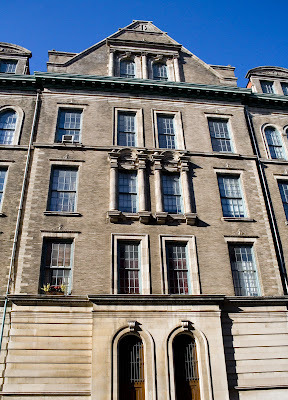 This school looks like a good bet, with its 15' ceilings and beautiful windows. I don't know if it's still true, but in 2000 this was called the gay building because so many gays had moved in. Streetscapes had a good article on this school in 1989. It seems that prior to the 1890s, schools were built in a factory style as befitted the idea of "the school life of a child as a grinding, manufacturing process . . . ." A new school architect, Charles B. J. Snyder, was appointed in 1891 and began building schools that would have an uplifting effect on the city's poor and working class sections, this being one of them. Reminiscent of an Italian village? 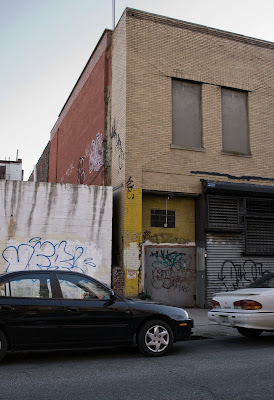 This building is at the break in 126th Street where it angled off (see where the sidewalk curves?). From now on, going west, it'll be a normal numbered street – horizontal. This is where 127th Street, just doing as it should, going straight ahead, is abruptly cut off by 126th Street as it angles off the horizontal. And it was so close to the end! 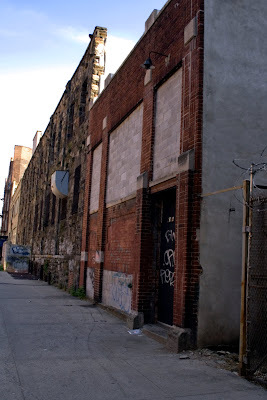 But this did create a spot for a nice narrow triangle building. See map. 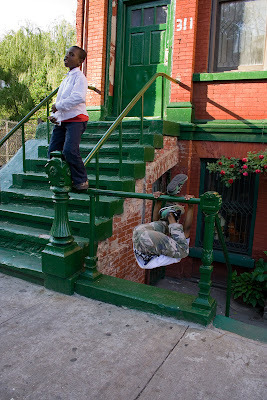 Meanwhile, on the south side . . .